Age 101 of Braceville, passed away peacefully Friday, April 12, 2019 at Amita Adventist Medical Center in Bolingbrook, with family at her bedside. Born November 4, 1917 in her Grandmother’s home in Salem, Oregon, spent her early childhood in the territory of Alaska before settling in Richey, Illinois. Florence Evelyn was a daughter of Harry Mason and Jessie (Waggoner) (Mason) Kelly. She graduated from Reed-Custer High School and went on to earn her teaching certificate from Illinois State University in Normal. Florence taught in the one room school house in Ritchey, before dedicating herself to her family and home. 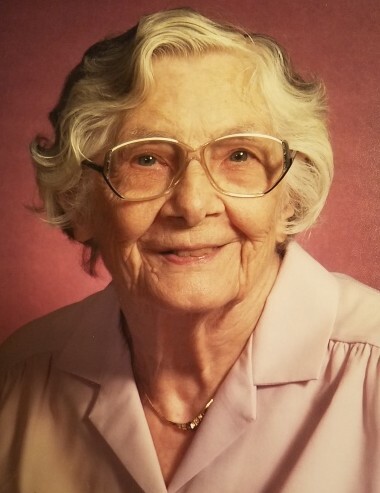 She was an active member of Braceville United Methodist Church, where she taught Sunday school for many years; belonged to the Gardner Senior Citizens, where she enjoyed playing cards, and was a former member of the Grundy County Rabbit Breeders Association. Florence enjoyed quilting by hand, and leaves behind countless heirlooms which were given to her children and grandchildren. She also proudly displayed many of her quilts at the Coal City Public Library and once, during the annual Grundy County Cornfest, she earned a blue ribbon for her handiwork. Florence was also an avid doll collector, and took pleasure in making clothes for her collection. Survivors include her children: DeAnn (the late Roy) Nielsen of Rice, Texas, Shirley Kennedy of Ottawa, Illinois, Thomas (Christine) Kennedy of Hepler, Kansas, Donald Kennedy of Crest Hill, Illinois, Kenneth (Patricia) Kennedy of Morris, Illinois and Lawrence (Linda) Kennedy of Bonfield, Illinois; (10) grandchildren: Roy (Patty) Nielsen, Robert (Debra) Nielsen, Erik (Kris) Nielsen, Jennifer Kennedy (Josh Hughes), Mandy Kennedy, Samantha Jo (Donald “D.J.” Kirby), Annette Muller (Jeffrey Larson), Victoria Halstead (Jason Robinson), Matthew Kennedy and Jared (Sara) Kennedy; numerous great grandchildren and great-great grandchildren, as well as nieces and nephews. Florence was preceded in death by her parents; husband LaVern Robert Kennedy, one son in infancy, William; siblings: Harriet Marcotte , Leila (Edward “Puggy”) Vilt, Florence “Toots” (J.R.) Cushing, Marguerite (James) Anderson, Dorothy Jean Kelly, Donald Kelly, Leroy Kelly, Robert Kelly, and Edward Kelly; two great grandchildren, Jessica and Casey and one great-great granddaughter, Maddison. The family will receive friends on Saturday morning, April 20, 2019 from 9:00 a.m. until the time of funeral service 11:00 a.m. at Reeves Funeral Home, 75 North Broadway (one block north of Illinois Route 113) in Coal City. Pastor Karen Fabian from Braceville United Methodist Church will officiate, and burial will follow in Oakwood Cemetery, Wilmington. Preferred memorials may be made as gifts in Florence’s memory to: Braceville United Methodist Church, or Gardner Senior Center, or other charity of donor’s choice. Funeral services and arrangements have been made under the direction and care of Reeves Funeral Home in Coal City. (815-634-2125).